Luxottica is the leading optical retailer in the United States in the eyewear industry. The brand currently operates over 4,600 stores, generating about $2.5 billion in retail sales each year. They are the largest company in the world, responsible for top brands like Oakley, Ray-Ban, and Versace. Their global sales totaled $8.8 billion each year. Although there is a push by the eyewear industry to start selling products online, the vast majority of sales for active firms still involves the old-fashioned process. Consumers must visit their eye doctor, receive a prescription, and then start the shopping process. 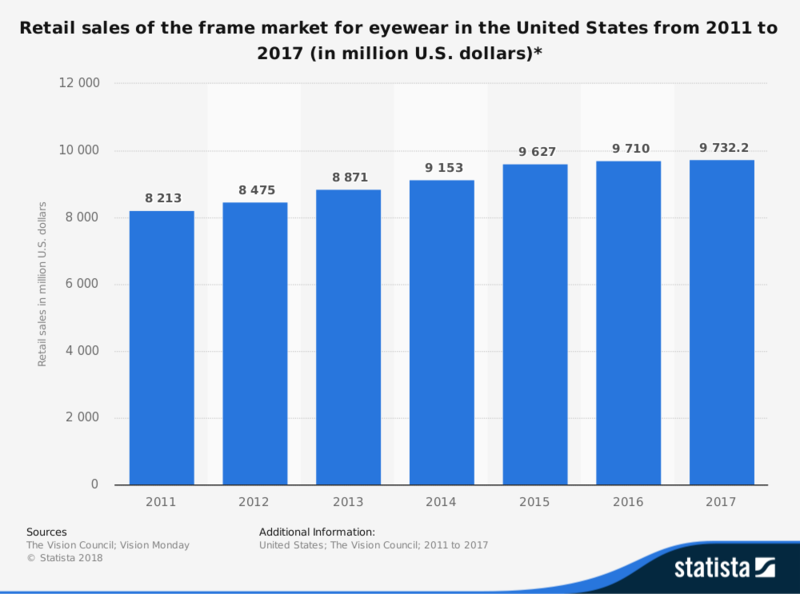 Even with frames sold directly by their physician, it is taking much longer for this industry to transition online than most other kinds of products. Prescriptions are a meaningful obstacle for this industry. Even if information about eyesight could be obtained through other means, a measurement called the “pupillary distance” is necessary for the proper grinding of eyewear lenses. Without this information, it would be almost impossible to create a functional pair of glasses. Despite these challenges, the eyewear industry continues to grow in several segments. #31. 39.5% of the costs handled by the eyewear industry involve purchases, which is almost 50% less than the average cost of all industries in all sectors. Wages, rent, and utilities are the primary expenses outside of purchasing for the average business. 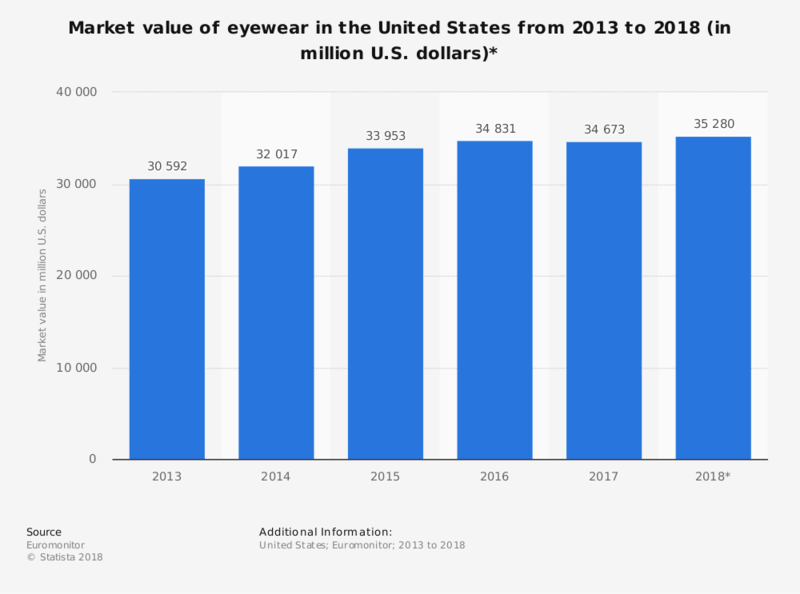 The eyewear industry offers strength on three specific fronts: a high upcharge on strong brands, increased access to medical care, and improved shopping methods for consumers. 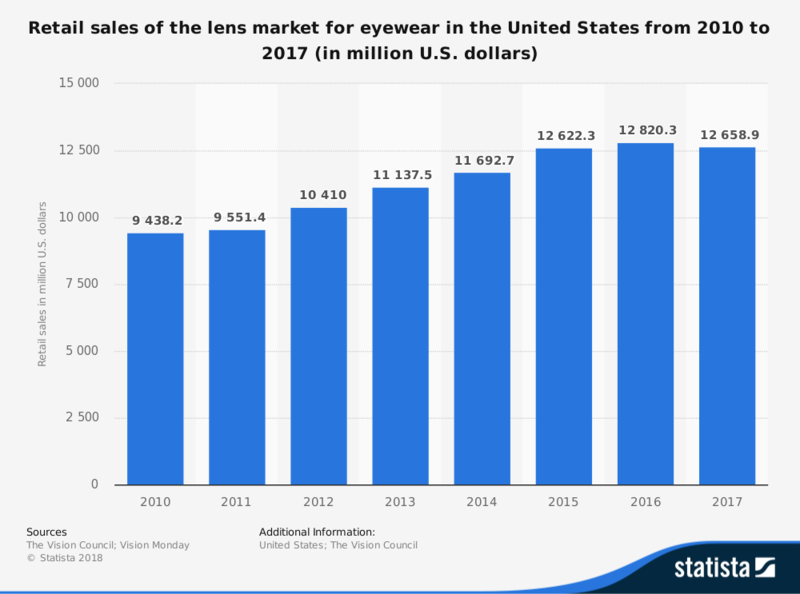 Despite there being several obstacles in the way for a consumer to purchase eyewear, the industry continues to see a consistent pattern of growth that averages about 5% per year. It is an exciting industry because it offers mature market stability with emerging market opportunities. Although Luxottica currently holds a dominant portion of the manufacturing business, there are numerous opportunities for a disrupter to get involved. The online sales segment is a perfect example of this, with Warby Parker being a known brand, but a majority of sales going to an unknown provider. Improved information access will help consumers embrace more online purchases. As Millennials continue aging in the next decade, a surge in new business will start heading toward eye doctors, eyeglass manufacturers, and lens makers. Expect real strength to continue with this industry for the time being unless some type of innovation makes the products become obsolete.